An exhibition commenting on the current state of Finnish Design will open the Changing Room of Design Museum’s collections exhibition. Back to the Present is an exhibition created by a Swedish curator duo Daniel Golling and Gustaf Kjellin. The curators Golling and Kjellin are known for their Summit web platform with which they produce exhibitions, a series of books and podcast discussions on contemporary design. Helsinki Design Weekly met them on the morning of the Opening. The Exhibition delivers a message on a sense of stagnation: formerly known as the pioneers on the international design field, Finnish designers of today are not able to renew their approach. When replying to the question regarding the consequences of excessive nostalgia, the curators name the risk of being too static; ”not pushing for real development”. In their curated exhibition, Golling and Kjellin use design objects to chart successful examples of Finnish product design that could also serve as examples for today’s designer generation. 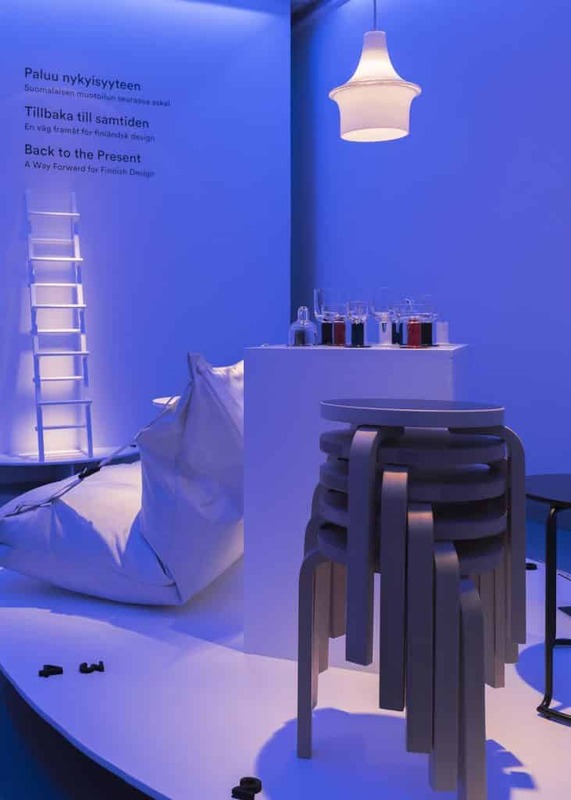 The exhibition argues that the most successful products combine both international trends as well as Finnish materials and manufacturing techniques. The chosen examples also highlight the strong collaboration between the designer and the producer. According to the curators, one way to return product design to the present could be the following: It is good for designers to seek inspiration from history for their thinking but not for the actual design language. International trends and impulses need to be followed inquisitively and applied to suit one’s own starting points. Back to the Present also comments on the importance of designers looking for balance between the global contemporary design and the local uniqueness. Successful design responds to a current phenomenon and uses this to stay relevant in the future, too. Back to the Present, 30 January – 17 September 2018 in Changing Room in Design Museum’s collections exhibition.